Enough is enough. Especially when it comes to a name. Many of you have undoubtedly faced a crisis or two about your own. It can come from anywhere, like changing (or NOT) your family name when getting married. Or dumping the curse of one you never liked. Famous examples abound. The great Texas-born classical pianist Van Cliburn was in fact Harvey Lavan Cliburn. Lady Gaga is Stefani Joanne Angelina Germanotta. Kirk Douglas was Issur Danielovitch. Marilyn Monroe came from Norma Jean Mortenson. Tony Curtis had been Bernard Schwartz. John Wayne was Marion Mitchell Morrison. When I was born in Boston 72 years ago this New Year’s Eve, my mom made my father promise not to name me “Harvey.” Dad’s father, who’d just passed away, was Herschel. So the “H” was unavoidable. But there were certainly better choices. She never forgave him. Me either. My middle name is Franklin, as my parents were big FDR fans. As an historian, I like it for Ben. The rabbit in the Jimmy Stewart movie was in fact a real-life “Pooka”, a Celtic spirit. So I am shedding my slave name. Instead, where viable, we go with my hippie logo: Sluggo. That silly moniker originated with a friend who thought I looked like a comic strip character, now long gone from the funny pages. Like me, that Sluggo had a sister Nancy. For more than a decade I lived with it on my communal farm, amidst friends and lovers who never knew my “real” identity. The name’s best feature is that little kids love it. It always morphs into “Swuggo”, prompting an instant smile. It’s also a decent WTF radio name, quick to say, puzzling, memorable, at home in Solartopia on KPFK and PRN. 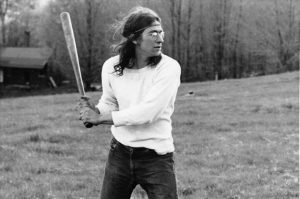 It stuck on the hippie farm in part because I was also a baseball player (see photo). Now in my early seventies, I remember myself in my early twenties as being a spectacular athlete. And, of course, the older I get, the better I was. Ask me after a few more brain cells disappear and I’ll tell you about my Hall of Fame career with the Red Sox, my banner years with the Celtics and my singles championships at Wimbledon and the US Open. But in the interim, “Harvey Wasserman” will stick around for bylines. “Sluggo” will pop up mysteriously in the middle, when an editor will let it ride. Like a Pooka, he’ll get ink on random name tags, along with “No Nukes” or “Solartopia”. He is ALWAYS the only Sluggo in the room. It’s a great ice breaker. And no hurricane, Weinstein or Debbie Schultz. So how about you? Got a name you HATE? One a parent stuck you with you NEVER forgave them for? Or one you LOVE but never had the nerve to adopt? Sure you do. Now take the leap!! You’ll be glad you did. Just be sure to pick one that makes you smile when kids mis-pronounce it. Harvey “Sluggo” Wasserman has many grandchildren who call him “Boppa” and/or “Harby.” “Swuggo” will now be added to the mix. Hear California Solartopia on KPFK 90.7 fm Los Angeles on Thursdays at 6:30 PM Pacific. 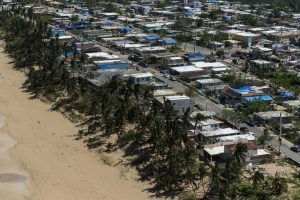 Blue roofs, temporary blue plastic sheeting, installed on homes damaged by Hurricane Maria, by the U.S. Army Corps of Engineers in partnership with FEMA in Ponce, Puerto Rico. Warring visions have now erupted over the energy and economic futures of Puerto Rico and the Virgin Islands. Will the islands become a cutting-edge green-powered solartopia for the benefit of their long-time residents? Or a fossil-fueled robber baron playground like Hong Kong or Singapore, set to operate for the profit of outside corporate investors? On the solartopian side, Senators Elizabeth Warren and Bernie Sanders have proposed a $146 billion green “Marshall Plan” to rebuild Puerto Rico and the Virgin Islands as a prosperous, self-sufficient home for the indigenous citizenry. 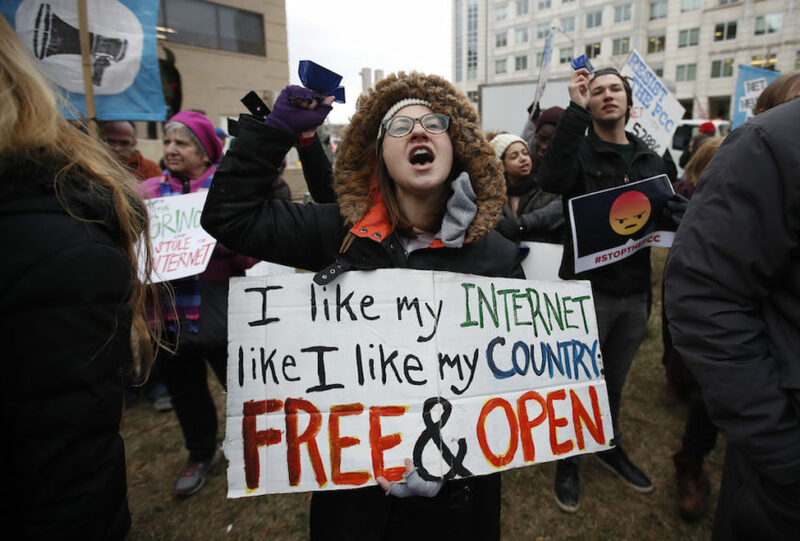 The bill is co-sponsored by Democratic Senators Ed Markey, Richard Blumenthal and Democratic Representatives Nadia Velazquez and Darren Soto along with Democrat Stacey Plaskett, the Virgin Islands’ non-voting Representative to Congress. Representative Plaskett has also joined Congressman Ted Lieu, Democrat of California, in co-signing a letter asking that all Federal Emergency Management Agency funds for rebuilding the electric grids of the islands go for solar energy, wind power, and decentralized microgrids. San Juan Mayor Carmen Yulin Cruz, who famously tangled with Trump over the direction of recovery plans, has said the Sanders-Warren-Lieu approach to rebuilding with green energy provides the blueprint for the “transformation” of the islands to local-controlled self-sufficiency. The Warren-Sanders bill would give local governments $62 billion for economic development, Medicare/Medicaid parity, and other locally determined needs. It would provide $27 billion more for infrastructure, and $13 billion for FEMA to rebuild the grid “with more modern, resilient technologies” than the coal, oil, and gas burners that powered the islands before Maria. Solar panels are already pouring in. Even before Maria, Puerto Rico had plans to add 1.5 gigawatts of solar capacity. At least one big solar array largely survived the storm, allowing a local greenhouse to resume business the day after the disaster. A large wind farm on the south side of Puerto Rico also got through, though its impact has been limited by the crippled grid. To do more, Tesla announced it would delay the unveiling of its electric-powered tractor-trailer unit to focus on delivering more batteries to Puerto Rico. The German company Sonnen, which was working pre-Maria with local customers to make the Puerto Rican grid more resilient, has been shipping inpanels, batteries, and micro-grids aimed at making hospitals and emergency facilities self-sufficient. So has the Houston-based Sunnova, which isretaining ownership of the hundreds of panels it has installed, then charging its customers a rate well below what they were paying before the storm hit. But not everyone shares the vision of a green-powered future. In October, Puerto Rico’s national utility, PREPA, made global headlines with a $300 million grid rebuilding contract given to Whitefish Energy, a two-year-old two-man operation based in Whitefish, Montana. Whitefish is the hometown of Trump Interior Secretary Ryan Zinke, whose son had worked for the company. When it began shipping in line workers at huge rates, they were showered by locals with rocks and bottles. Finally the contract was voided and PREPA’s president resigned. More recently, PREPA awarded a $200 million contract to Cobra Acquisitions LLC, a one-year-old subsidiary of Oklahoma-based Mammoth, which is primarily in the oil, gas, and fracking business. Nearly all Puerto Rico’s pre-Maria power came from fossil fuels. Its future plans still include a $400 million liquid gas terminal. The fossil-fueled vision has strong support among lawmakers like Doug Lamborn, Republican of Colorado, who is backed by the oil and gas industry. Lamborn told a House Committee on Natural Resources hearing in early November that “renewables are great, but to provide that much electricity in that short a time is unrealistic.” Lamborn instead supports natural gas, with a rollback of environmental protections to encourage drilling and imports. Committee Chair Rob Bishop, Republican of Utah, also the recipient of fossil industry support, has joined Lamborn in opposing an EPA presence that might restrict drilling and imports for a restored fossil-fired grid. Benjamin Dierker, of the libertarian Foundation for Economic Education, wants an “economic freedom zone” where environmental, minimum wage and other legal requirements would disappear. The “less restricted environment with more available resources would open the doors to investment and real estate development,” he says. Amid all of this corporate conniving, the people of Puerto Rico remain in dire straits. At least 200,000 citizens have already left Puerto Rico, most headed for Florida. Residents who have been restoring school buildings and re-starting classes at their own expense are being told by local authorities they must have inspections that never happen and permits that never come. Education activists are afraid that private charter schools will crush the public system, as in New Orleans after Katrina, where only a few public schools remain. Because land titles have been passed down through generations of the poor, some ancestral residents are not being let back into what’s left of their homes because they can’t officially prove ownership. “Land prices will plummet,” Segal says. 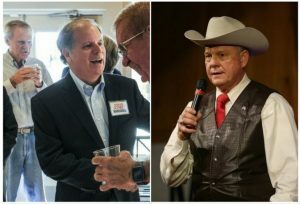 “That will set off an unrestricted corporate rampage” aimed at converting the region to a Trump-style playground of shady financial centers, high-end hotels and mega-casinos for the super-rich. That’s a future the people of Puerto Rico must avoid — and green energy is one way to do it. 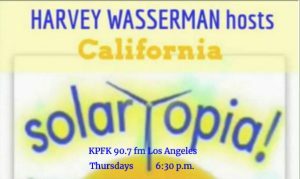 Harvey Wasserman hosts California Solartopia at KPFK-Pacifica, 90.7FM in Los Angeles, and the Green Power & Wellness podcast at prn.fm. 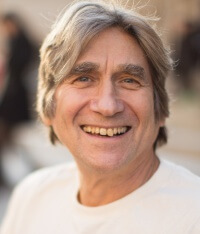 He is author or co-author of about 20 books, including Solartopia! Our Green-Powered Earthat www.solartopia.org.